Once you see our list of The Best Red Velvet Recipes you won’t be able to think of anything else for the rest of the day. Don’t know about you, but we literally can’t get enough of these classic treats, and we know you will love them just as much as we do! 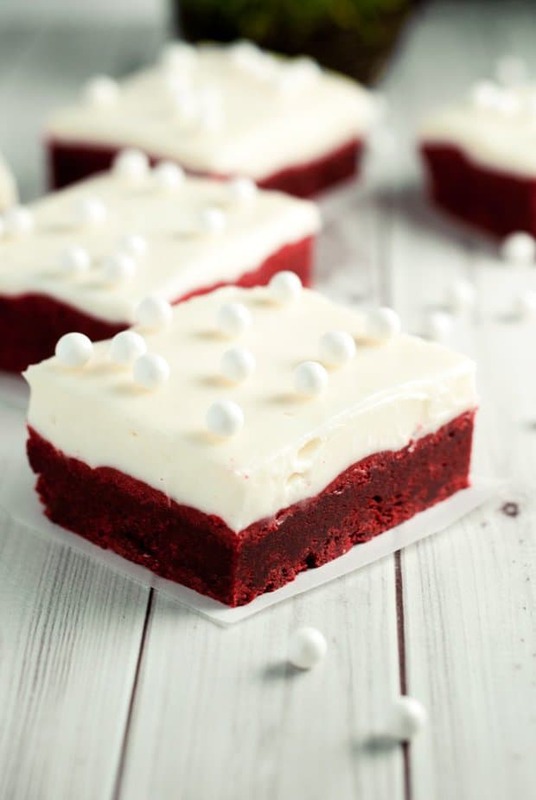 Have you always loved red velvet desserts? I have! When I was a little girl I always asked my mom for a “red birthday cake” and she always made me red velvet. I totally loved it as a kid, and now I am completely obsessed with it as an adult. 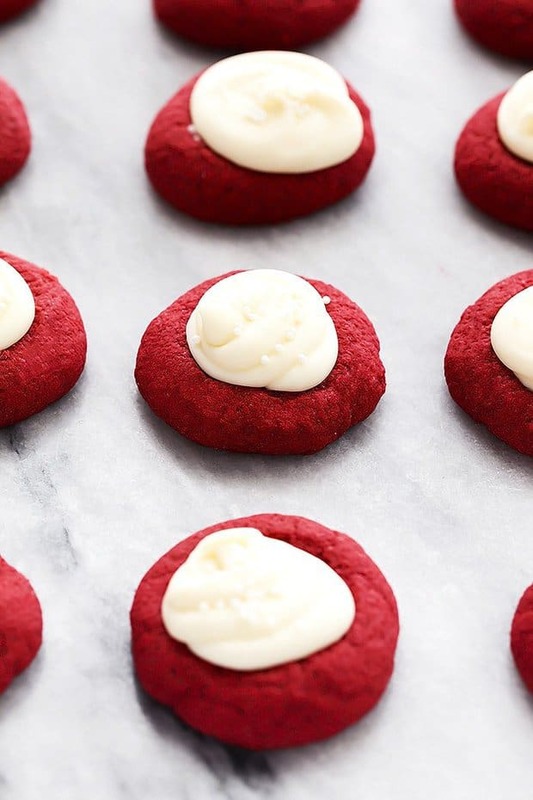 Who knew that there were so many amazing desserts that you could make that were red velvet flavored? 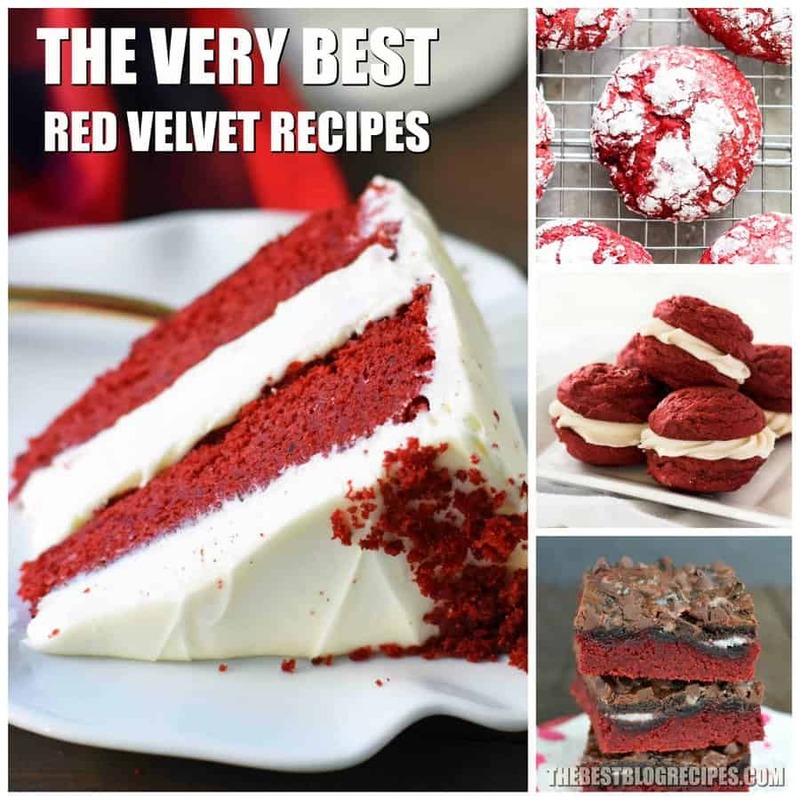 I always thought of cake, but there are delicious ways to make red velvet cookies, cheesecake, dips, and bars as well. Red Velvet Cake is traditionally served as a red, mahogany, maroon, crimson or scarlet colored chocolate layer cake. You will then want to serve it with a white cream cheese homemade frosting. The cake is commonly served on Holidays such as Christmas or Valentine’s Day. 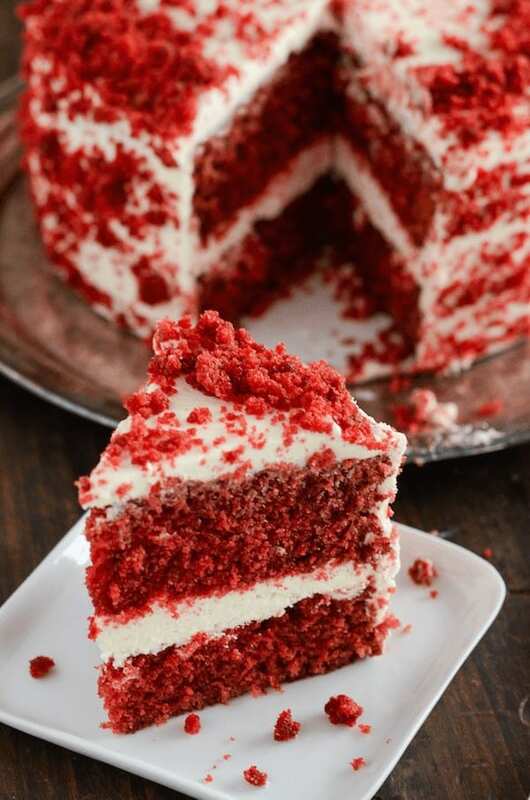 Modern Day Red Velvet Cake is made with red dye that is added to the ingredient process. The result is a deep red cake that is not only beautiful to look at, but it tastes amazing too. You have a few different options when it comes to making the actual cake itself. If you are pressed for time you can quickly pick up a box cake mix from the store and whip together a delicious dessert that your friends and family will love. If you feel like getting your hands dirty in the kitchen then making a homemade recipe is the way to go. Traditional cake recipes use simple ingredients — and a red velvet recipe is no different. Eggs, Flour, Sugar, Oil, Cocoa Powder, Water, Red Food Dye, and a baking dish is all you need. Easy Peasy! What sets Red Velvet apart and makes it special is the end color that really makes it pop! 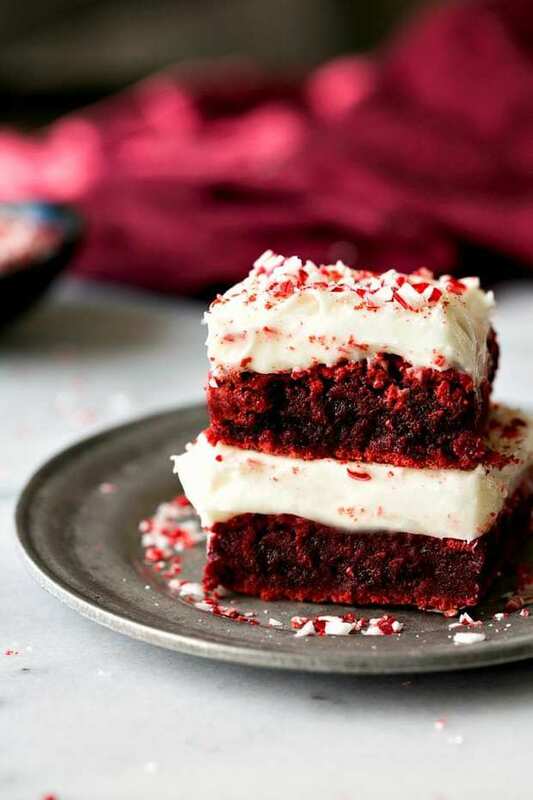 We have compiled this list of our favorite red velvet desserts and we are certain that you are going to want to make these recipes again and again. 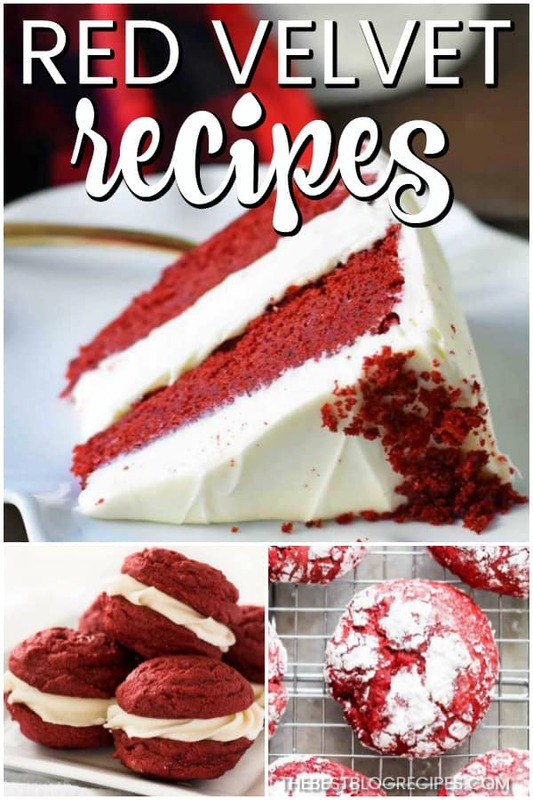 They are so easy to prepare, and who doesn’t love the traditional an amazing flavor of red velvet? 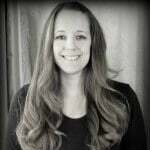 I have made the desserts in this list for so many different occasions, and at every function I have ever taken a red velvet dessert to, it is gone in a second. People just love the amazing flavor of these treats! We know that these desserts will become staples in your list of favorite sweet treats, and that you will make them over and over again. Enjoy these twists on everyone’s classic favorite! 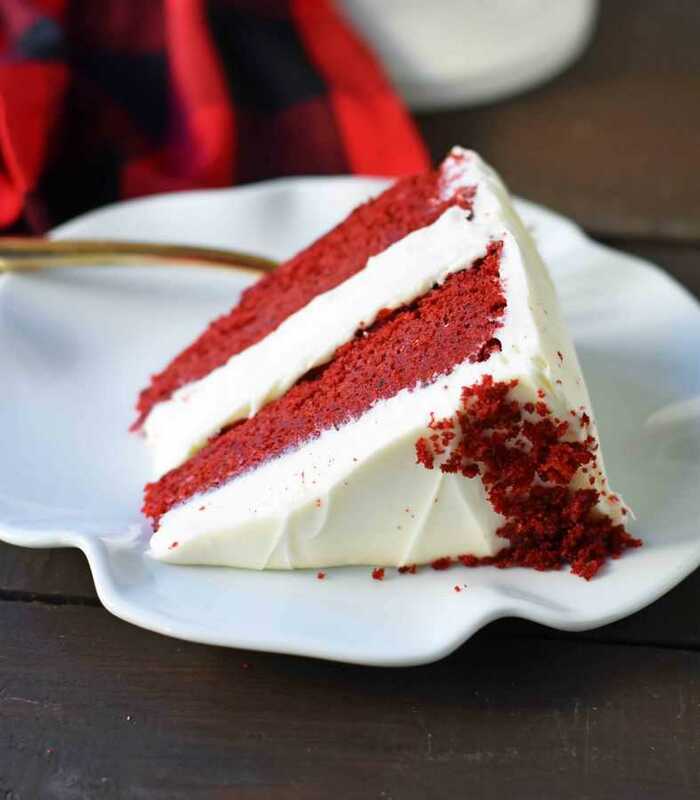 From Modern Honey :: Click HERE for the RECIPE The perfect red velvet cake recipe with sweet cream cheese frosting. 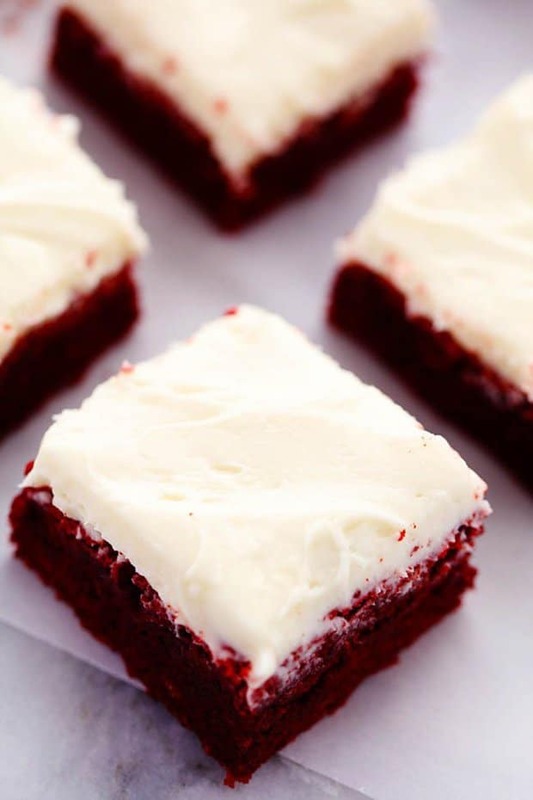 From The Recipe Critic :: Click HERE for the RECIPE These red velvet brownies are seriously the perfect brownie recipe! Perfectly moist and chewy with the bright red color. The cream cheese frosting is the perfect finishing touch! These are AMAZING! 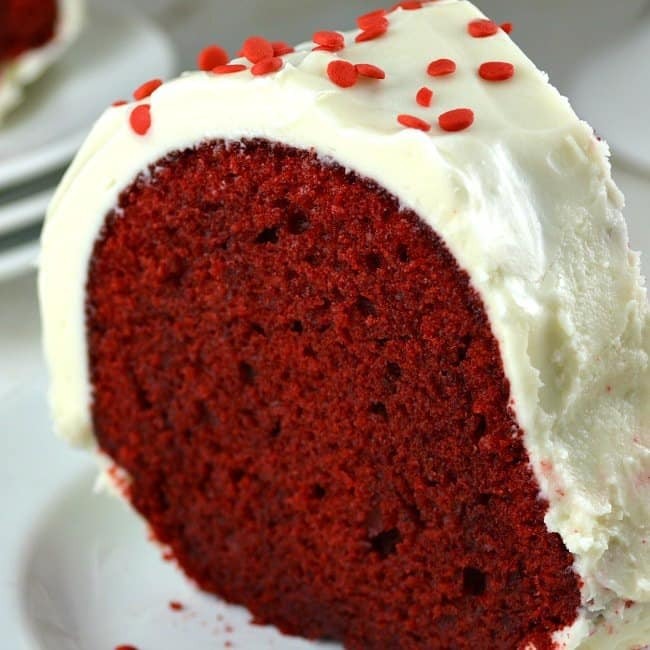 From The Novice Chef :: Click HERE for the RECIPE This is a classic red velvet cake recipe. It has a little chocolate, buttermilk, a bunch of red food coloring and distilled white vinegar. From The Salty Marshmallow :: Click HERE for the RECIPE Crockpot Red Velvet Hot Chocolate – This indulgent, rich and creamy hot chocolate is made easy in the crockpot! 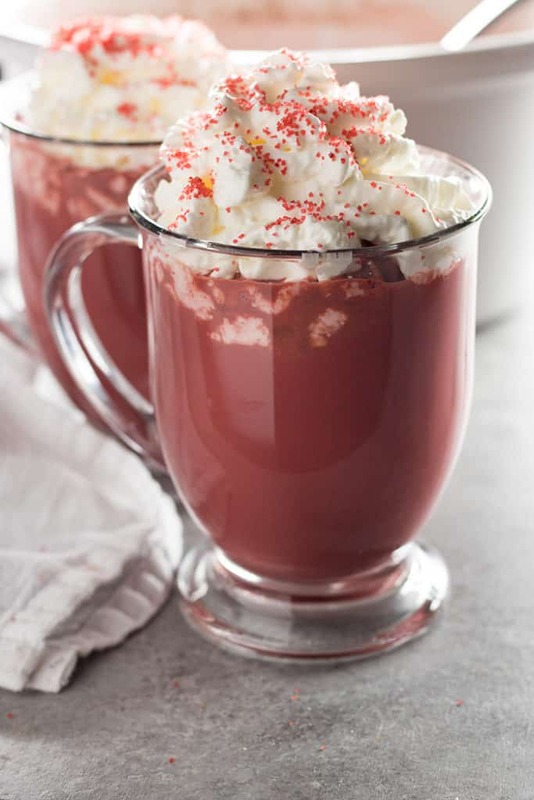 Red velvet hot chocolate is the perfect treat to warm you up this holiday season! From A Simple Pantry :: Click HERE for the RECIPE These are so cute and are so so yummy. You will go crazy for these cookie bars. 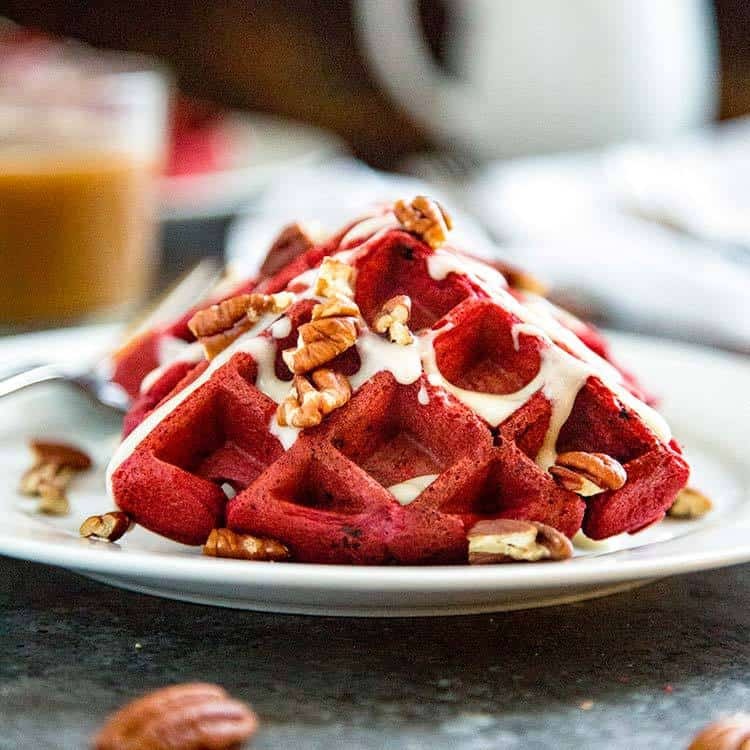 From Kevin is Cooking :: Click HERE for the RECIPE These waffles are soft, chocolate infused and the cream cheese glaze and chopped pecans on top make for one special breakfast, or dessert treat. Enjoy! From Gonna Want Seconds :: Click HERE for the RECIPE Red Velvet Cake is one of my favorite things in this whole wide world! 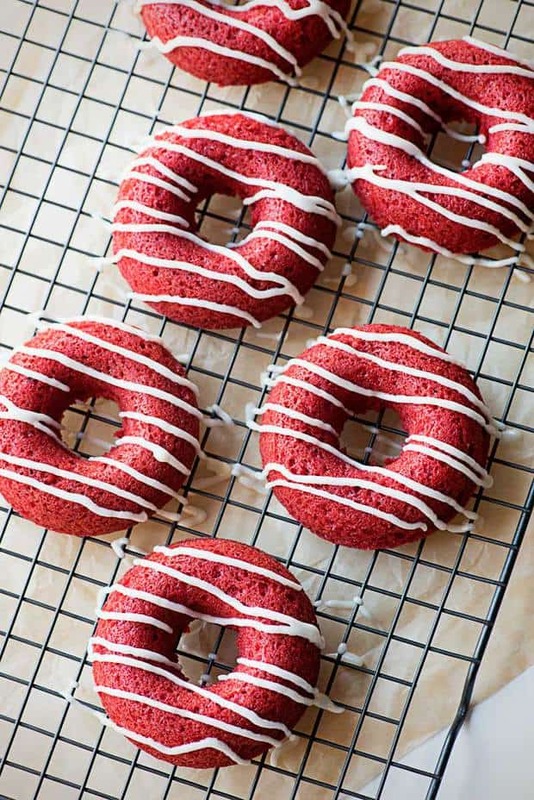 From Homemade Hooplah :: Click HERE for the RECIPE Super moist and spongy baked donuts in classic red velvet flavor topped with powdered sugar or classic vanilla icing. Need I say more? 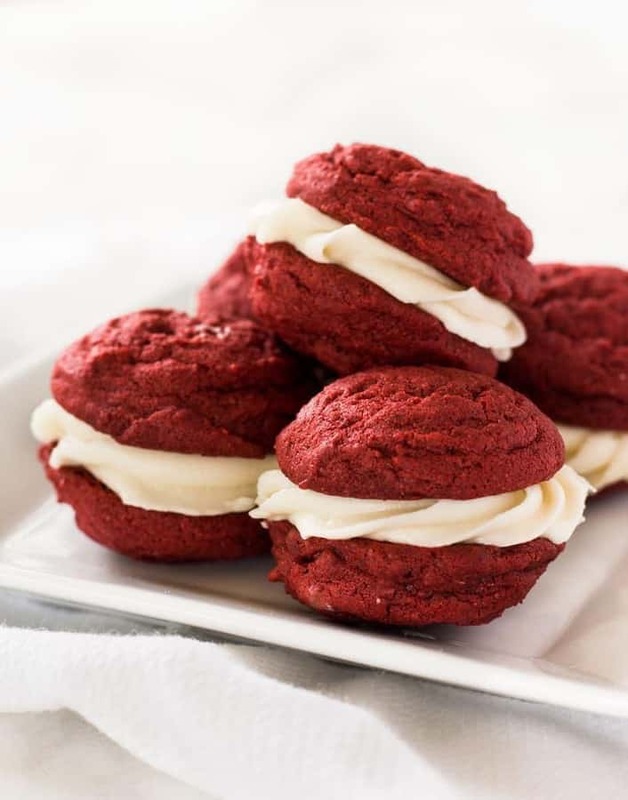 From If you Give a Blonde a Kitchen :: Click HERE for the RECIPE Red velvet sandwich cookies are chewy and filled with cream cheese frosting. Try this dessert recipe for Christmas or Valentine’s Day! From The Recipe Critic :: Click HERE for the RECIPE Red Velvet Peppermint Brownies with Peppermint Cream Cheese Frosting are the perfect holiday brownie! A rich and chewy vibrant red peppermint brownie piled high with peppermint cream cheese frosting. 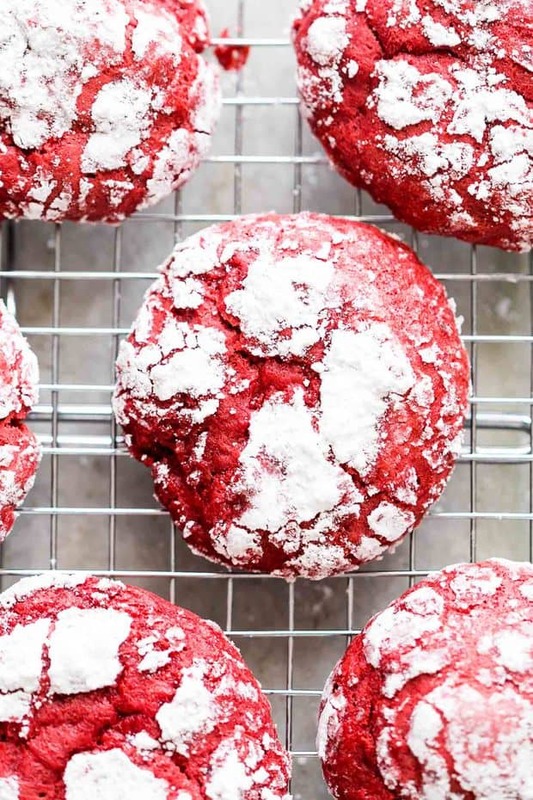 From My Food Story :: Click HERE for the RECIPE Cakey Red Velvet Cream Cheese Crinkle Cookies are soft, chewy cookies that are made from scratch and will fit right in with your holiday plans. Use them for cookie swaps, gifting or just to pass around the Christmas table! 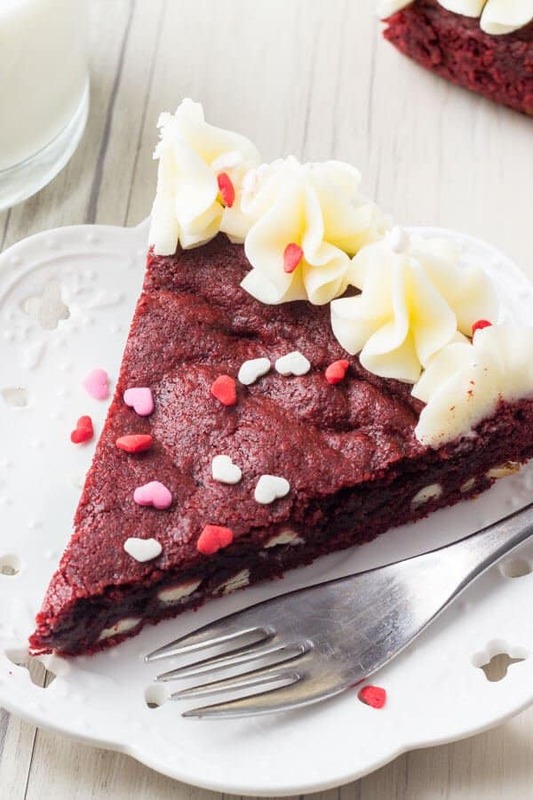 From Just So Tasty :: Click HERE for the RECIPE This GIANT Red Velvet Cookie Cake has a delicious mild chocolate taste, beautiful red color, soft & chewy texture, and is filled with white chocolate chips and decorated with cream cheese frosting. From The Recipe Critic :: Click HERE for the RECIPE These thumbprint cookies are buttery pillows of dreamy cookie goodness filled with rich cream cheese frosting and I have eaten WAY too many of them. But hey, it’s not swimsuit season yet. So bring on the sweet V-day indulgences! 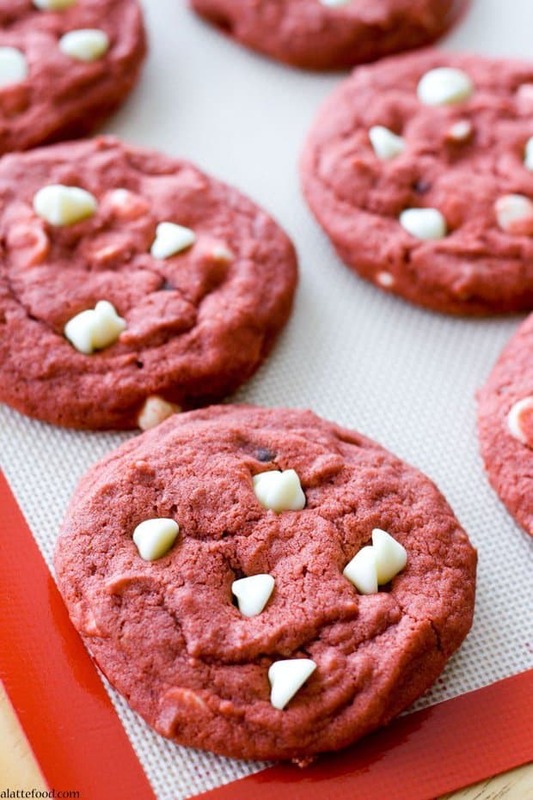 From Dinner at the Zoo :: Click HERE for the RECIPE These easy Red Velvet Cookies start with a cake mix and are loaded with white chocolate chips. A simple yet impressive cookie that yields fabulous results! 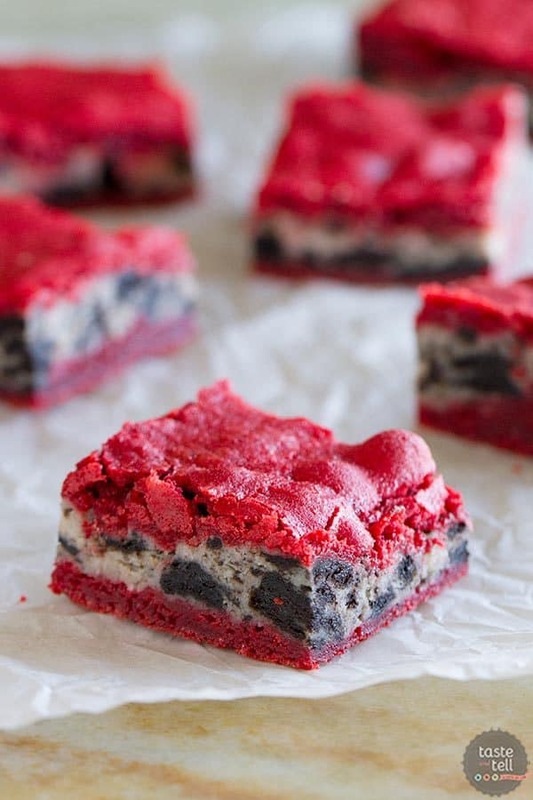 From Inside Bru Crew Life :: Click HERE for the RECIPE Cookies and chocolate chips add an intense chocolate taste to these Red Velvet Oreo Fudge Bars. They are the perfect treat for snacking on this Valentine’s Day. 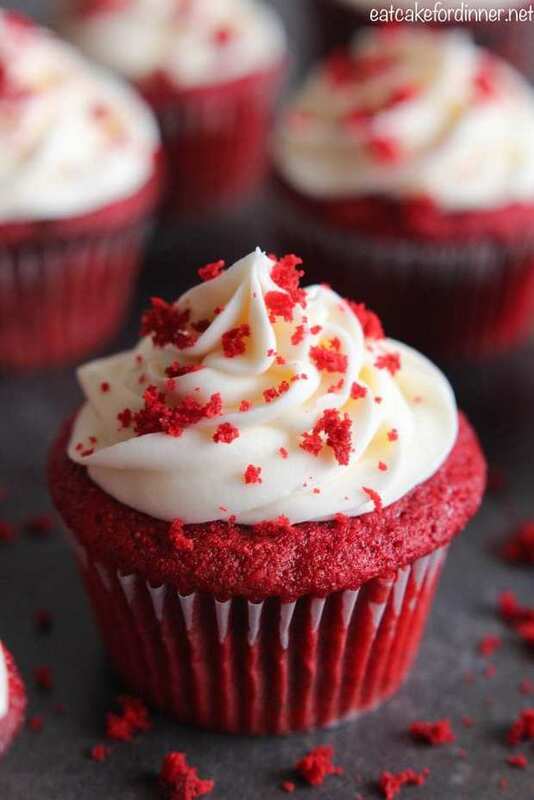 From The Recipe Critic :: Click HERE for the RECIPE The BEST Red Velvet Cupcakes are a light cake with a beautiful red color and a slight chocolate flavor with a little tang from the buttermilk. They are perfectly moist and topped with cream cheese frosting. You will agree that these are the best! 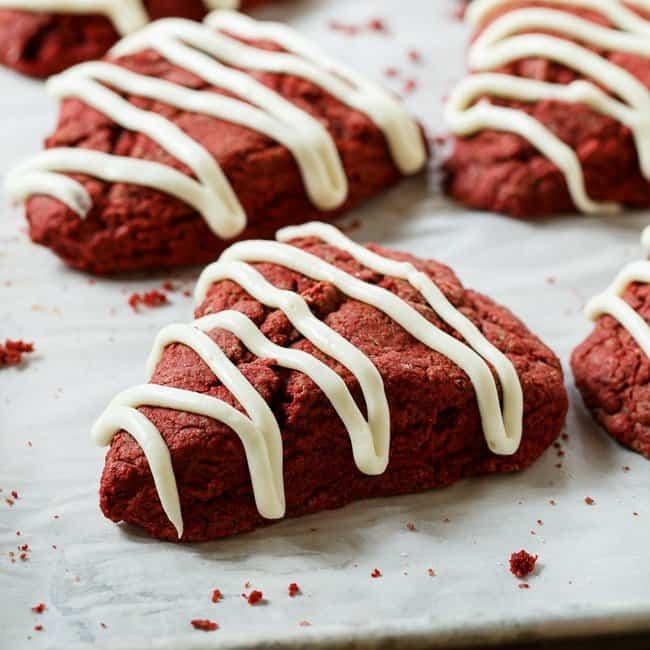 From Spicy Southern Kitchen :: Click HERE for the RECIPE Tender Red Velvet Scones with a cream cheese glaze are just the thing to go with your coffee during the holiday season. Scones are one of my very favorite things to bake and I don’t think they get nearly the attention they deserve. If you haven’t tried making homemade scones, you are missing out. Warm from the oven, they are so tender, delicate, and rich. Every home baker should fall in love with baking scones. 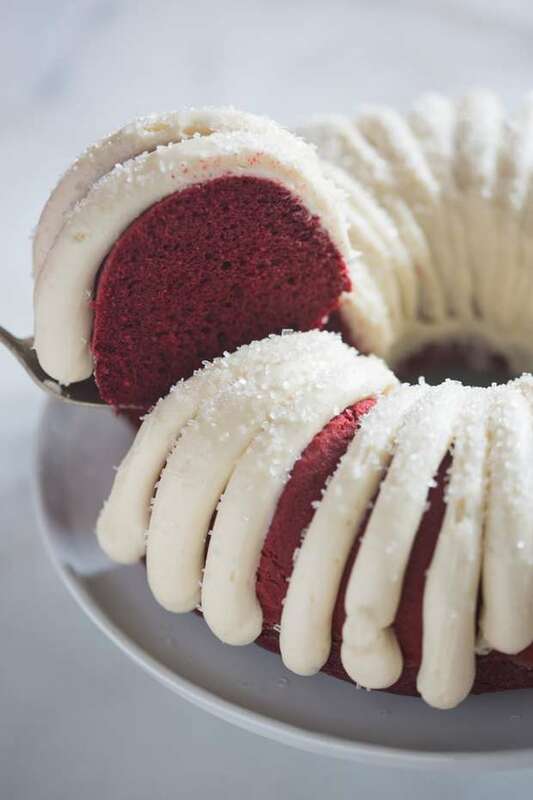 From Tastes Better From Scratch :: Click HERE for the RECIPE Moist and tender Red Velvet Bundt Cake with cream cheese frosting. Add some chocolate chips for a an even more delicious chocolate flavor. 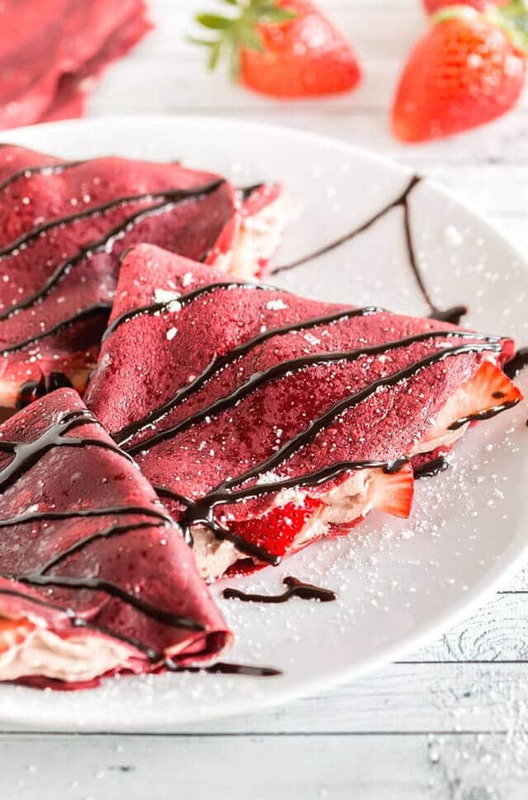 From Tastes of Lizzy T :: Click HERE for the RECIPE Red Velvet Crepes filled with Chocolate Whipped Cream and fresh strawberries will be the perfect breakfast to serve on Valentine’s Day! 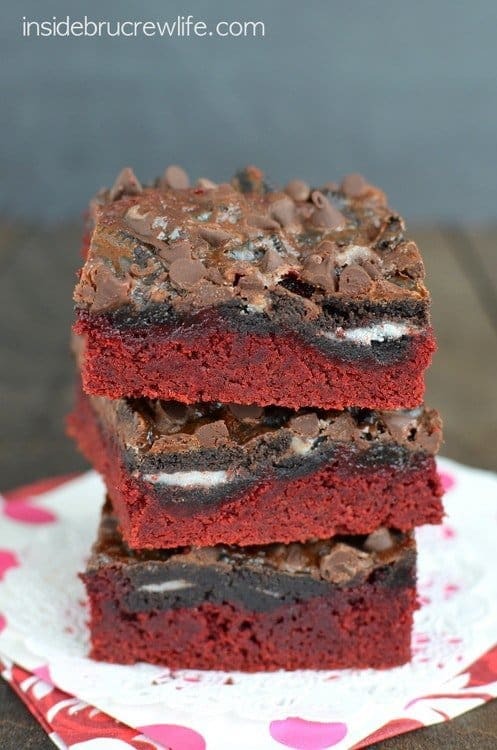 From Taste and Tell :: Click HERE for the RECIPE Red velvet brownies are layered with a cream cheese filling in these layered Oreo Cream Cheese Stuffed Red Velvet Brownies that are perfect for any red velvet lover. 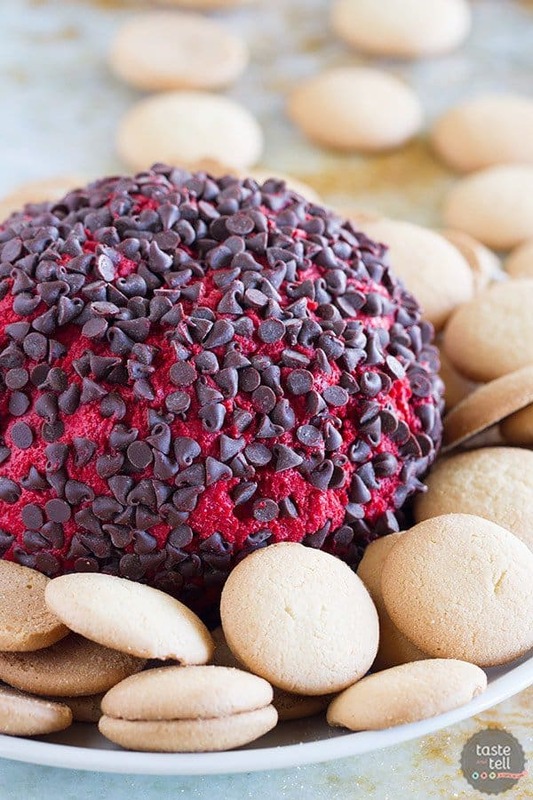 From Taste and Tell :: Click HERE for the RECIPE This Red Velvet Cheese Ball is the ultimate dip for red velvet lovers!! This sweet version of a cheese ball will have you going back for more! 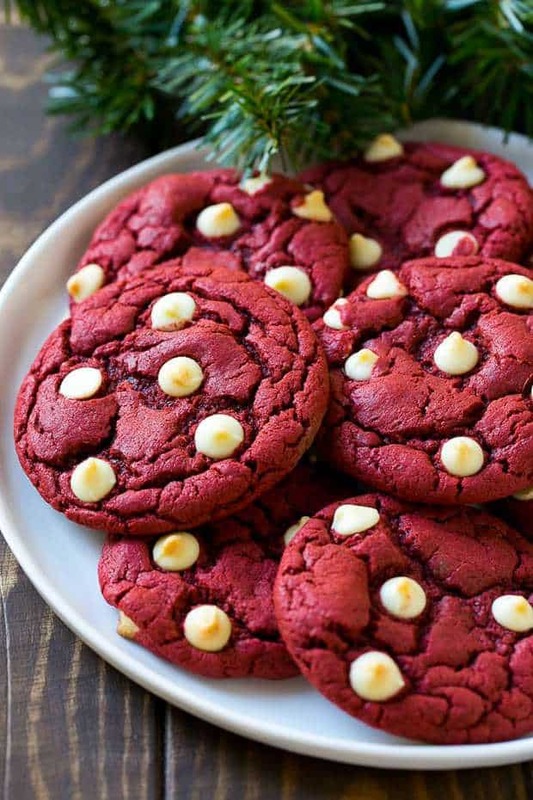 From A Latte Food :: Click HERE for the RECIPE Red Velvet White Chocolate Chip Cookies: These bright red cookies are soft, chewy, and packed with incredible red velvet flavor! 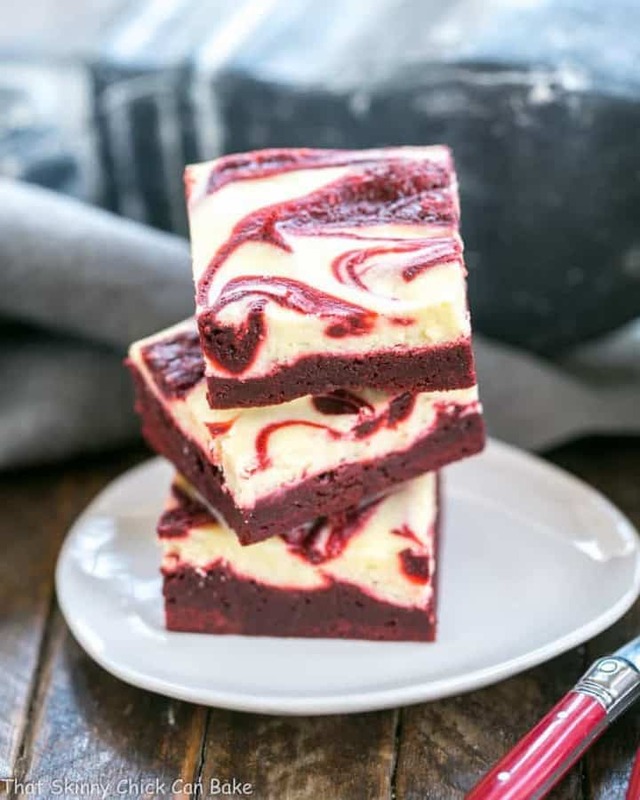 From That Skinny Chick Can Bake :: Click HERE for the RECIPE These Red Velvet Cheesecake Swirl Brownies are a rich, multifaceted dessert that are perfect for the holidays and ALL year long!